These words encompass the theme of a website that presents a new way to learn ArcGIS concepts and technology and emphasizes problem solving rather than software functionality. Share results using online maps and apps. 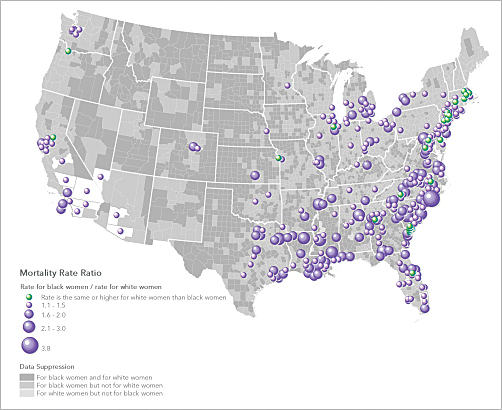 Lessons feature scenarios that reflect realistic GIS workflows such as studying breast cancer mortality rate patterns. Newcomers to GIS can learn geospatial concepts and the basics of the ArcGIS platform. They can discover how to use maps to better understand information, tell stories, compile data, perform geographic analysis, and monitor situations or operations. They can immediately analyze data and make maps with no major upfront investment other than time. GIS professionals will find advanced lessons at Learn ArcGIS, which will help them become more skilled at conceptualizing, analyzing, and solving spatial problems in addition to creating and sharing maps. Learn ArcGIS doesn’t replace traditional instructor-led training or web courses in ArcGIS. It whets learners’ appetites and entices them to dig deeper. Clint Brown, director of software products and leader of the Learn ArcGIS team, said the website designed by the team provides a new pathway for any type of learner to discover the power of mapping, start making maps, and begin solving spatial problems using geographic analysis. The site is interactive. Much of the work is done on the web using the mapping and analysis tools and data available from Esri’s cloud-hosted ArcGIS Online (arcgis.com). Lessons include online maps that learners can explore to find a spatial question or problem that interests them. 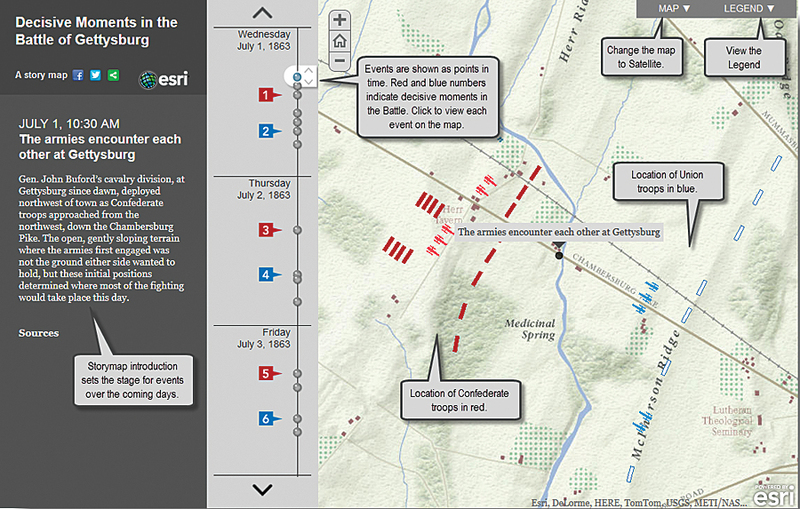 At Learn ArcGIS, students explore history by examining decisive moments in the Battle of Gettysburg during the American Civil War. Each project starts with a story that includes a short introduction and background on a situation. One project, A Capitol Offense, is about the incidence of crime in Washington, DC. The student then gets to map crime data and perform hot spot analysis to find clusters of high and low crime rates. In the Create a Community Garden Web App project, students create a large-scale custom basemap and deploy it as an app that garden plot holders can use to report pests, weeds, and other problems. Students can work with an app that resembles the one they will create, select icons for weeds and pests, and drag them onto the map next to the affected plots. Using Learn ArcGIS doesn’t require the purchase of any Esri software. Anyone can try out the lessons with the sample data, sign up for free membership in the LearnGIS organization, or use an existing ArcGIS Online for organizations account. The LearnGIS organization provides limited-time access to the cloud-based tools and data in ArcGIS Online needed to complete the lessons. For lessons that require ArcGIS for Desktop (which now includes ArcGIS Pro), Collector for ArcGIS, or Explorer for ArcGIS (iOS), free trial-use student versions are available. Lessons are available in a searchable, easy-to-navigate gallery. Scenarios reflect realistic GIS workflows such as finding areas where Medicare costs are significantly higher; analyzing emergency shelter access in the event of a volcanic eruption; finding suitable sites for parks; and studying breast cancer mortality rate patterns. New lessons will constantly be added. The site will especially appeal to people new to GIS who want to become familiar with how maps can help them better understand a problem or issue such as how income and ethnicity shaped the 2008 US presidential election. The lessons teach people how to carefully consider the question they want to answer, use the appropriate analysis method, create informative and interesting maps to share with others, and learn to read and understand the maps they use and make. “Not doing it all is not a full analysis,” Buckley said. Initially, the Learn ArcGIS team and other Esri staff will author projects and lessons, but Esri distributors and partners worldwide will add content in the future. As the site evolves, features will be added that foster feedback from learners and let them interact with each other. “Our long-term goal is to build a worldwide community of learners and educators, with everyone contributing ideas, feedback, and information in a fun, social environment,” said Catherine Ortiz, another Learn ArcGIS team member. To start working with Learn ArcGIS, visit learn.arcgis.com.